The solar system's largest planet will swing to within a mere 368 million miles of Earth on Monday night, making its closest pass in 47 years. Massive Jupiter will rise in the east as the sun sets and climb across the heavens as the brightest object in the sky apart from the moon. At midnight it will be directly overhead. It will set in the west just before dawn. The planet, named for the Roman king of the gods, nears the Earth roughly every 12 years. This will be the closest the planet has come to Earth since 1963. It won't be this close again until 2022. Jupiter can easily be seen with the naked eye, but a telescope or binoculars will provide an even better view. Jupiter -with dozens of moons and an enormous magnetic field — resembles a star in composition, but it did not grow big enough to ignite. The planet’s swirling cloud stripes are broken by storms, the most massive being the Great Red Spot, which has raged for hundreds of years. New thermal images from powerful ground-based telescopes show swirls of warmer air and cooler regions never seen before within Jupiter's Great Red Spot, which has persisted for as long as 200 to 350 years, based on early telescopic observations, enabling scientists to make the first detailed interior weather map of the giant storm system. The observations reveal that the reddest color of the Great Red Spot corresponds to a warm core within the otherwise cold storm system, and images show dark lanes at the edge of the storm where gases are descending into the deeper regions of the planet. These types of data, detailed in a paper appearing in the journal Icarus, give scientists a sense of the circulation patterns within the solar system's best-known storm system. "This is our first detailed look inside the biggest storm of the solar system," said Glenn Orton, a senior research scientist at NASA's Jet Propulsion Laboratory in Pasadena, Calif., who was one of the authors of the paper. "We once thought the Great Red Spot was a plain old oval without much structure, but these new results show that it is, in fact, extremely complicated." Sky gazers have been observing the Great Red Spot in one form or another for hundreds of years, with continuous observations of its current shape dating back to the 19th century. The spot, which is a cold region averaging about 110 Kelvin (minus 260 degrees Fahrenheit) is so wide about three Earths could fit inside its boundaries. Jupiter's atmosphere has a zig-zag pattern of twelve jet streams which make up its signature pastel-toned bands. Earth, by comparison, has only two jet streams. 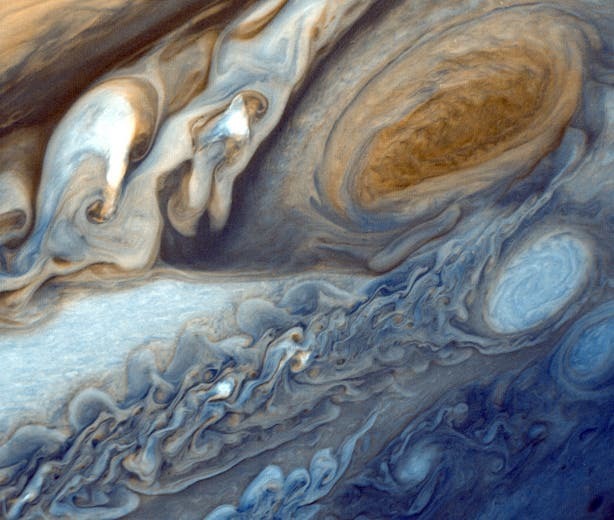 The Great Red Spot is sandwiched between two of these jets streams, forcing the winds that power those perimeter winds to deflect around the spot. Spacecraft observations of the way bands of high winds scream past the Red Spot show how the spot — inaccurately described as a storm — is actually far calmer at its center than other parts of the Jovian atmosphere. The winds at the center are just 9 or 10 miles per hour, whereas around the perimeter they exceed 200 miles per hour. 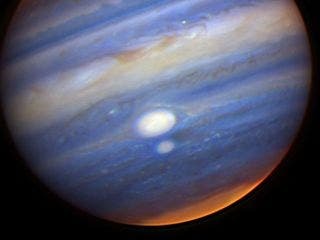 A new, third red spot, which is a fraction of the size of the two other red spots, has been observed on Jupiter to the west of the Great Red Spot in the same latitude band of clouds. The visible-light images were taken on May 9 and 10 with Hubble's Wide Field and Planetary Camera. The new red spot morphed from a white oval-shaped storm to a red color indicating its swirling storm clouds are rising to heights like the clouds of the Great Red Spot. Astronomers surmise that one possible explanation is that the red storm is so powerful it dredges material from deep beneath Jupiter's cloud tops and lifts it to higher altitudes where solar ultraviolet radiation — via some unknown chemical reaction — produces the familiar brick color. Because all three oval storms are bright in near-infrared light, they must be towering above the methane in Jupiter's atmosphere, which absorbs the Sun's infrared light and so looks dark in infrared images. Turbulence and storms first observed on Jupiter more than two years ago are still raging, as revealed in the latest pictures. The Hubble and Keck images also reveal the change from a rather bland, quiescent band surrounding the Great Red Spot just over a year ago to one of incredible turbulence on both sides of the spot.. The thermal images obtained by giant 8-meter (26-foot) telescopes used for this study — the European Southern Observatory's Very Large Telescope in Chile, the Gemini Observatory telescope in Chile and the National Astronomical Observatory of Japan's Subaru telescope in Hawaii — have provided an unprecedented level of resolution and extended the coverage provided by NASA's Galileo spacecraft in the late 1990s. Together with observations of the deep cloud structure by the 3-meter (10-foot) NASA Infrared Telescope Facility in Hawaii, the level of thermal detail observed from these giant observatories is comparable to visible-light images from NASA's Hubble Space Telescope for the first time. One of the most intriguing findings shows the most intense orange-red central part of the spot is about 3 to 4 Kelvin (5 to 7 degrees Fahrenheit) warmer than the environment around it, said Leigh Fletcher, the lead author of the paper, who completed much of the research as a postdoctoral fellow at JPL and is currently a fellow at the University of Oxford in England. This temperature differential might not seem like a lot, but it is enough to allow the storm circulation, usually counter-clockwise, to shift to a weak clockwise circulation in the very middle of the storm. Not only that, but on other parts of Jupiter, the temperature change is enough to alter wind velocities and affect cloud patterns in the belts and zones. "This is the first time we can say that there's an intimate link between environmental conditions — temperature, winds, pressure and composition – and the actual color of the Great Red Spot," Fletcher said. "Although we can speculate, we still don't know for sure which chemicals or processes are causing that deep red color, but we do know now that it is related to changes in the environmental conditions right in the heart of the storm." Unlocking the secrets of Jupiter's giant storm systems will be one of the targets for infrared spacecraft observations from future missions including NASA's Juno mission. The image above was taken by the Cassini probe on the way to Saturn.